Welcome to Macy’s Christmas Gift Cards Giveaway Event! Santa is on his way to deliver your gifts! And this year, you will be receiving Macy’s Christmas Gift Cards to shop at your favorite store! #MerryMacys ! 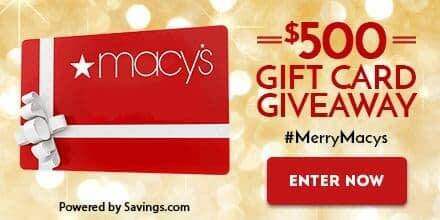 Savings.com has teamed up with Macy’s to give away $500 worth of gift cards! 10 winners will receive a $50 gift card to Macy’s! Tuesday, December 15th at 12:00 AM ET to Friday, December 18th at 11:59 PM ET. Open to US, 18+ years of age. Ten (10) winners will receive a $50.00 gift card to Macy’s. The winners will be chosen via a lottery drawing and notified on Tuesday (12/22) via the email address they used to enter. Disclaimer: Work Money Fun is not responsible for prize fulfillment for Macy’s Christmas GC Giveaway.